At the same time, a style of calligraphy unique to Japan emerged. Writing had been popularized, and the kana syllabary was devised to deal with elements of pronunciation that could not be written with the borrowed Chinese characters. Japanese calligraphers still fitted the basic characters, called kanji (漢字), into the squares laid out centuries before. 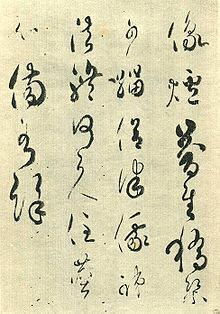 A fragment, Kara-ai no hana no utagire (韓藍花歌切, AD 749) is considered the first text to show a style unique to Japanese calligraphy; it shows a Tanka (短歌) poem using Man'yōgana, thus deviated from contemporary Chinese calligraphy. Ono no Michikaze (AD 894-966), one of the so-called sanseki (三跡, "Three Brush Traces"), along with Fujiwara no Sukemasa and Fujiwara no Yukinari, is considered the founder of the authentically Japanese wayō (和様) style, or wayō-shodō (和様書道). This development resonated with the court: Kūkai said to Emperor Saga, "China is a large country and Japan is relatively small, so I suggest writing in a different way." The "Cry for noble Saichō" (哭最澄上人, koku Saichō shounin), a poem written by Emperor Saga on the occasion of Saichō's death, was one of the examples of such a transformation. Ono no Michikaze served as an archetype for the Shōren-in school, which later became the Oie style of calligraphy. The Oie style was later used for official documents in the Edo period and was the prevailing style taught in the terakoya (寺子屋) schools of that time. This page was last edited on 13 February 2019, at 07:48 (UTC).